I have a very interesting article today. 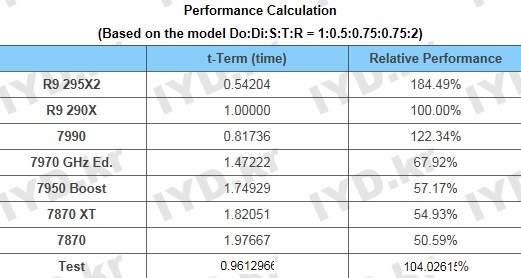 Normally I wouldn’t post simulated benchmarks from any source but the man behind the curtains is so authentic that he is literally, single handedly, responsible for the entire R9 295X/Hawaii XTX leak. You might remember DG Lee from some months ago whence he successfully reverse engineered the existence of the Hawaii XTX Core and therefore the alleged R9 295X. DG Lee goes through multiple variations of the simulation with wildly varying results and even a variation with stacked DRAM where he uses my HBM table. Alright lets dive right in. First of all the source page is here. But if his history is any indicator it could be pulled at any second. He uses his home made algorithm that employs the Stream Processor Count, Texture Mapping Unit Count, Raster Operator Count, GPU and RAM Clock Speed and the Bus Width to predict (very accurately) the performance of a Radeon GPU (the R9 295X) in this case. 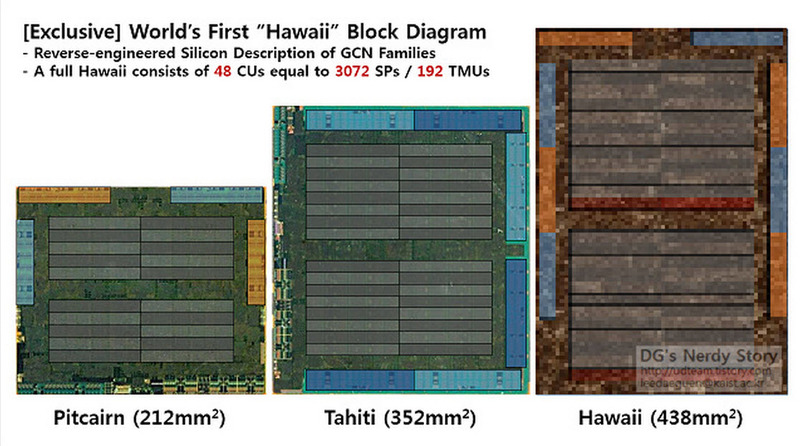 This simulated benchmarks also unveils the probable performance of the complete and fully uncut Hawaii XTX Core. Without any further ado the first benchmark simulates the GPU with the unlocked core ‘as is’ and clocks of the R9 290X. Now we see a performance increase of about 4-5% relative to AMD’s last flagship. Once again the results are not that impressive although they are nearing the acceptable mark (~10%). It is at this point that he leaves behind the established number crunching and enters the more speculative field. The fact of the matter is that we have no idea what else AMD is going to do with the card apart from the fully unlocked Hawaii core. They can put stuff in (as you will see in a minute) that can increase performance by leaps and bounds. Alright! now we are talking. The results now show a 21% improvement which is much more impressive than 5% and very acceptable. So what happens if we ramp it up to 4-Hi HBM? Well you get a performance boost of almost 30% relative to the R9 290X, which means that you have now beaten the Dual Chip 7990. Needless to say these are very impressive numbers but they are Dependant on the fact that AMD will utilize HBM. So unless Red pulls one on us, we are looking at a 5% performance increase in ideal scenarios, with 7-8% performance increase with very optimized drivers. By Syed Muhammad Usman Pirzada. We cater to your constant need to remain up to date on today’s technology. Like us, tweet to us or +1 us, to keep up with our round the clock updates, reviews, guides and more.